Handle Body: 3-11/16" L x 1-1/8" W x 3/8" Thick. 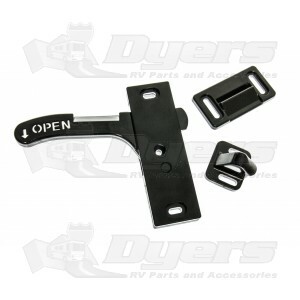 - Handle extends 2-15/16" from body. - Mounting holes spaced 3-1/16" apart. Strike: 2-3/16" L x 1-1/8" W.
- Mounting holes spaced 1-9/16" apart. Clip: 1-1/8" L x 15/16" W x 13/16" T.
- Mounting holes spaced 3/4" apart.